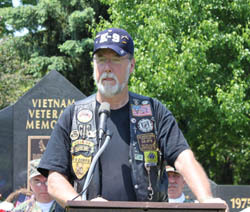 Back in December 24th 1949 there was a Vietnam veteran born. He was born in a small town in the state of West Virginia. Went to school at Rainelle West Virginia and loved playing baseball and football and he was one of the best baseball players in the state. Moved to Michigan in 1966. Attended Ypsilanti High where he played baseball and football. Graduated in 1969. After graduation he returned to W. Virginia. In April of 1970, the pro’s had a walk-on try out camp to play baseball in the majors. On May 1st of 1970 he was going to turn Pro. The word had come down. On May 1st he got a call and was advised that his draft letter has arrived. Draft letter from Uncle Sam, not pro baseball. Well, so much for going pro. Returned to Michigan and was induction into the Army on May 18th, 1970 and departed to Fort Knox Kentucky. After basic training he went to the MP school in Georgia. After completion of MP School and finished at the top of his class, he was asked if he would like to go to the K-9 School with the knowledge that he would end up in Vietnam. Shipped out to Vietnam in January 1971. Once there I said to myself, “Thank God I have a dog to save lives." I knew what the K-9 unit I was with was all about saving lives. And today I wouldn’t change a thing. Discharged from the service on the 2nd of December 1971.